It's December, which means I can start to embrace the 'C' word. Yes, Christmas is a little under 4 weeks away and I can begin to consider what I want to do over the festive period. 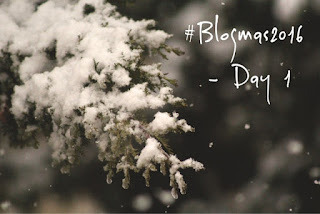 My partner mentioned to me that she is going to be partaking in #Blogmas this year. It's a comitment bloggers make to publishing a post a day on the topic of Christmas from the 1st to 25th December, a bit like an advent calendar. I've decided to join her and do my own Blogmas, I fully expect that some of my posts will be a bit short, but we'll see how I get on! I've got plenty of ideas for posts, but if there's anything in particular you'd like me to blog about during Blogmas drop me a comment below.